I've written quite a bit about Detroit's recent history, particularly the Motor City of the last ten years -- Kwame Kilpatrick and the aftermath of his corrupt administration, the subsequent bankruptcy and emergence from it, the binding of local government, business and nonprofit forces in creating a new template for leadership, and the very real rebound that Detroit is currently experiencing. Detroit is indeed booming, but it's not growth generated by external forces. The city is in the process of regaining favor by losing its stigma. Detroit's not gaining in population; in fact, it's still losing people, albeit at some of the lowest year-to-year levels seen over the last 60 years or so. The Detroit metro area isn't gaining people either. In 1970 Metro Detroit had 4.5 million people. In 2016 it had 4.3 million. But the metro area is nearing the completion of a major economic transition as it moves from a manufacturing-dominant economy to a more mixed modern economy, and the transition is bearing fruit in gains in metro gross domestic product. Neighborhoods near downtown are showing improvements hardly imagined in my lifetime, as the Detroit Reclamation Project continues to gather momentum. And that's exactly it: in a city and region that aren't gaining new residents, there's a transfer taking place. Suburban offices that left the city are returning downtown, and former suburban youth are pining for the Midtown/Corktown/Riverfront urban lifestyle. Yesterday's announcement that Ford Motor Company bought one of Detroit's most iconic ruins -- a building vacant for nearly 30 years -- so that it can move its mobility division from suburban Dearborn into a now-booming part of town is emblematic of what's happening. It's a great thing for the city. But there's something else going on that rarely gets mentioned. Detroit's suburbs are unsettled right now. Unlike most other metro areas, Detroit's suburbs doubled down on suburbia in a major way, and never envisioned a future where the city would even begin to make a credible comeback. Can Detroit's suburbs co-exist with a redeemed Detroit? The economic and social withdrawal from Detroit by the business community and the white middle class was about as complete as it could be. In many ways, Patterson's prediction did indeed come to pass. Because the withdrawal was complete, there were things that developed in the Detroit suburbs that typically happened in comparable urban cores. 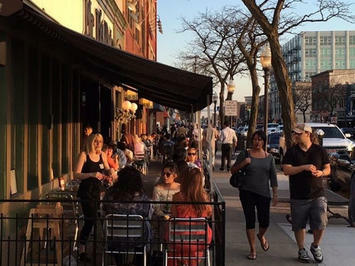 Southeast Oakland County, which includes the suburbs of Ferndale, Royal Oak, Hazel Park, Oak Park, Madison Heights and others, became the default "gentrifying hipster" spots of metro Detroit. While the stigma placed on Detroit was alive and well, these communities developed much in the same way we see in other urban cores nationwide. "We are professional couples or singles with no kids and strong work ethics. We support the arts, travel, and extensive reading. We focus on home maintenance and improvement. We use our phones to check for the best prices and redeem both print and mobile coupons." "Young, mobile, well-educated, and well-employed, we are more likely to rent in low-density, urban neighborhoods throughout the country. We go online for professional networking, online dating, and blogging. We buy natural, organic, or environmentally-friendly products." That definitely sounds like the demographic that's been behind the "back-to-the-city" movement in cities nationwide. It's just that, in the Detroit area, it happened beyond the city limits (by the way, if you haven't tried ESRI's Tapestry Segmentation Model, I really urge you to give it a test drive). Also in Oakland County, two major office centers, one in Southfield and the other in Troy, developed as Detroit collapsed. Interestingly, both emerged close to the hip burbs of southeastern Oakland County -- Southfield is a 10-15 minute drive to the west, Troy is 10-15 minutes to the north. Businesses were able to tap into a young and educated talent pool rather easily. Today, however, Detroit's young and educated have more options. The Seven Point Two -- the weird name (it's the area in square mile terms) given to the collection of neighborhoods that comprise Detroit's Greater Downtown -- is becoming attractive to the people who for years headed to Royal Oak or Ferndale. The conveyor belt pattern is familiar to many -- graduate from college and live in a cool neighborhood with tons of entertainment options, settle into a less-cool but just as entertaining neighborhood as you mature, and find a suburban area with nice schools as your kids reach school age. Same in metro Detroit as elsewhere -- it just started in the suburbs. But because metro Detroit's population growth has been flat for more than a generation, there's very nearly a zero-sum cause and effect here. The city's loss decades ago was the suburb's gain. Today's city gain is coming at the expense of the suburbs. It may be that Ferndale, Royal Oak and the rest of southeastern Oakland County inhabit that second step on the conveyor belt, becoming the less-cool but still entertaining spots, relative to the burgeoning hot spots in the downtown/Midtown/Corktown areas. I see that as having a ripple effect through other suburbs -- the Birminghams and Bloomfield Hills and beyond. This could also force some real soul-searching for the office centers in Southfield and Troy. Much like the city did 60 years ago, it could be said that they took the growth for granted and expected it to last forever. If businesses choose to move downtown to be where the talent pool is choosing to go, what will that mean for them? Ford's move into the Michigan Central Station building will tell us a lot. Lastly, I didn't even mention the middle-class and working-class suburbs of western Wayne County, the Downriver area, or Macomb County, the ones that have been extremely reliant on manufacturing workers living in small Cape Cods until they were able to upgrade to bigger homes even further from the city. They will have to do some soul-searching as well. Again, I stress that this is, in a sense, Detroit simply reclaiming what it lost as it acquired its stigma over the last 60 years. It's settling into a position familiar to other cities nationwide. The economic and cultural divide between the two was too great. For better or worse, the city's rebound has the ability to equalize them. The suburbs just better be ready.